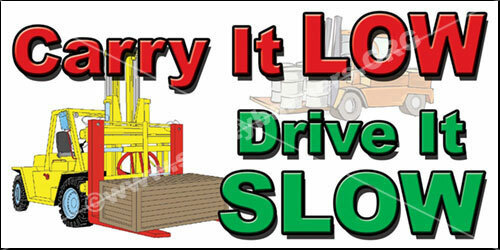 Safety Banners for Forklift Safety. Safety Banners built in Memphis, Tennesseee USA. 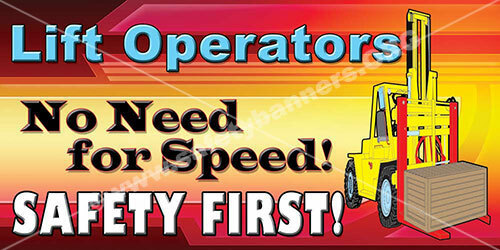 Forklift Safety Banners - Horizontal – Vertical – we do BOTH. SafetyBanners.Org is the ONLY safety banners manufacturer that offers forklift safety banners in BOTH Horizontal AND Vertical Format. About 100 workers are killed each year as a result of forklift accidents. About 1/4 of these fatalities are caused by overturning. Other common causes are workers being struck by materials, workers being struck by the forklift, and workers falling from the forklift. Forklift operation is not as simple as it looks. But with a little experience, it's not an impossible skill to master. Unfortunately, those who operate forklifts day in and day out have a tendency to take short cuts and to ignore basic safety rules. They develop the old "It can't happen to me" attitude. 2. 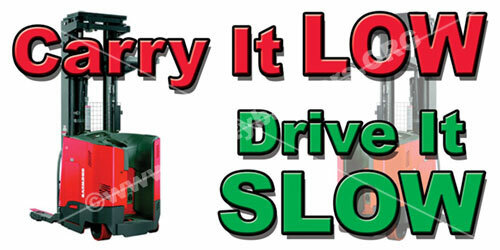 Maintain a safe following distance from other forklifts - about three vehicle lengths.